Most of us have experienced an instance where our hands go numb. Sometimes it’s when we wake up in the morning after sleeping on an arm. The hand will feel numb and/or tingly and it takes seconds to minutes before it starts feeling normal again. This is a typical sensation due to compression of nerves that allow us to feel through our hands. When a nerve is compressed (by sleeping on your arm for example) the signal gets blocked, and usually the points farthest away from the origin of the nerve will start tingling and become numb. However, I see people who report numbness in one or both hands even when they are not doing anything at all. How does this happen and what can be done to help keep it from getting worse? In this series we will explore some common ways pathological numbness can occur. When we move our arms, not only do muscles move, but so do many other structures including our nerves and arteries/veins. Just like when you find tight muscles that don’t move as well as others, nerves and blood vessels can become trapped between or beneath structures. One diagnosis that is common to hear is Thoracic Outlet Syndrome or TOS. 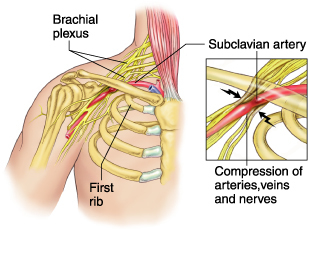 TOS occurs when the brachial plexus (part of your nervous system), or the subclavian artery/vein is being compromised by structures in the neck or upper extremity . In 95% of all TOS cases the brachial plexus is involved, 5% of cases involve the arterial system, and 2% involve the venous system . Most commonly, individuals who experience TOS are middle-aged women with respiratory dysfunction and forward posture, but not all of them present these traits. Studies have found that even environmental or traumatic stress and congenital abnormalities can contribute to TOS. The incidence and prevalence of TOS varies widely due to the conflicting definitions of the diagnosis . Thus, the official prevalence and incidence is unknown, but studies have ranged the incidence between 1 and 80,000 per million people . Symptoms can change based on what is being compressed if the nerve is causing TOS. Patients will complain of pain radiating down their arms and either hypersensitivity or hyposensitivity in their arms/hands. Patients with a blockage in the vascular system will report ischemic pain or numbness moving into the hand. Many times a patient will complain of weakness in grip as well. There are four possible spaces that can cause the compression that results in TOS: The sternocostovertebral space, the scalene triangle, the costoclavicular space, and the pectoralis minor space. Most often, the result of the compression is from tightness in musculature or decreased joint space from subluxed joints. However, a physical therapist must rule out any tumors of the thyroid, lymph nodes or a Pancost Tumor of the lung as well . Thoracic Outlet Syndrome can be treated conservatively with physical therapy. A physical therapist is skilled at diagnosing and treating TOS. If you’re concerned that you have TOS, contact a physical therapist to schedule an evaluation. 1] Andrews, J., Harrelson, G., & Wilk, K. (2012). Physical rehabilitation of the injured athlete (4th ed., pp. 317-318). Expert Consult. Hooper, T., Denton, J., McGalliard, M., Brismée, J., & Sizer, P. (2010, June 18). Thoracic outlet syndrome: A controversial clinical condition. Part 1: Anatomy, and clinical examination/diagnosis. Retrieved August 6, 2015. Silva, R., & Selmonosky, C. (n.d.). The Thoracic Outlet Syndrome (TOS) and its apparent relation to multiple sclerosis. A preliminary report. Retrieved August 7, 2015.